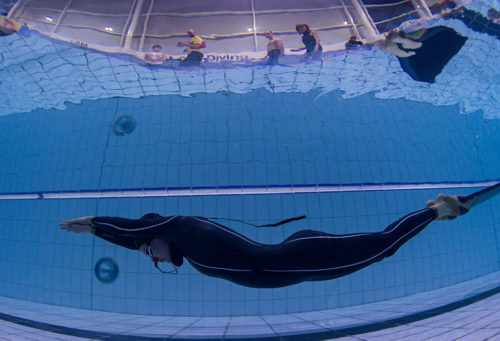 The No-Fins Freediver clinic is designed to be an introduction to No-Fins swimming and to help the student develop the basic skills, techniques and knowledge necessary to start the sport efficiently. 50% OFF if you do the course a second time for additional experience. Students will be introduced to exercises designed to work on style and how to design a training program. Advanced techniques will be covered far beyond any current course syllabus. We will use video analysis to help improve stroke. All instructors/guest speakers are to be previous UK squad members and/or UK record holders. There will be a minimum of two, hopefully three depending on student numbers to keep ratios low. It will take the form of a short theory introduction with some videos, a pool session of around 3 hours and a follow up theory session to go through videos taken in the water on the day. There will be technique demonstrations, training ideas and other valuable information. The bottom line is, if you are poor at no fins you will get big benefits and if you are already good, the fine tuning will get you extra distance. Equipment for use without fins for training and how it differs from other freediving equipment. Dry training to develop the body for no-fins freediving, warm up routines and breath up procedures. Dry training to develop the body for no-fins freediving, warm up and breath up procedures. How to get correct weighting. Stretching specifically for no-fins use. Mental preparation for a dynamic. Perform a stretching routine suitable for preparing the body for a no-fins freediving session. Perform apnea swims using no-fins for a maximum distance of 25m, to practice style and technique. Keep practicing the no-fins style in the pool. Design a personal technique drill for further training with the help of the instructor. Knowledge development, dry practical, two pool sessions. All freediving equipment used during the course will be provided and included in the price. Payable to the site if applicable. Be 18 years or older, have completed the medical statement and be able to swim at least 100 metres non-stop and 300 metres with mask, snorkel and fins. Have completed the AIDA ** Freediver course/ AIDA ** Pool Freediver course or equivalent. After the course you can choose to do the remote coaching option, this entails regular phone calls, video reviews (you need to send the videos for me to review but we can discuss that), and training plans. I usually work with an athlete for a few months after the course to make sure the knowledge has sunk in, and you get the continued benefts of me helping you to improve. This is the key to long term success. Find the next available No-Fins Freediver Clinic from the google calendar below. If you cannot find any dates for the above course, please contact steve@freedivers.co.uk or call +44 (0) 7940 998915 and we will accommodate you the best we can. NOTE: Make sure you have the correct course location as there may be a few. Reserve your spot on the course by making the corresponding payment on the next page. When you purchase the course you will receive your Medical & Liability forms, please bring them filled in and signed on the day. NOTE: If you have answered ‘yes’ in any of the questions then you will need a doctor’s signature to verify it is safe for you to take part in freediving. Congratulations – you’re all done. We will send you an email in the next day or two with further course information including some exercises to start off with. Course fees include pool fees and equipment. For AIDA courses the certification costs are due at the end of the course you wish to be signed off for, normally 20 Euros per certification. The PADI courses include the first certification when you purchase the Freediver Touch. Open water fees are not included, some sites are free, some charge and that is payable locally. Is all the equipment included? Yes – all equipment is provided, the school carries full kit, enough to kit several groups at once, so sizing is rarely an issue. Cross overs – if I am already a certified Freediver with another agency? We have a cross over chart so that we can enrol you onto the appropriate course. Also those agencies that are not recognised, we can find fair ways of enrolling you onto the appropriate course and getting value from it. A freediver is a freediver, as well as rules being rules. 18 years to become an AIDA Freediver, if you have parental permission and you are joining with a parent, the age is 16 years of age. From the time I complete the pool and theory, and do the open water, how long do I have to complete the qualification? 12 months unless you visit us in-between that time and do some refresher training, then it can last another 12 months from that date. It is also possible to be signed off at AIDA 2* Pool Freediver level (you would be charged a nominal fee for the certification if doing it using this method). Most people however want to move onto the open water section of the course and complete the full AIDA 2* Freediver course. Do I need to be fit to do this course? You can get fit doing the sport! General health is important for safety, you will get a medical form to fill in, it is a self-declaration form. If you have any significant medical problems (heart/lungs, diabetes, asthma for example) you would need to see a Doctor first to see if the sport was for you. Many people have mild symptoms that do not preclude them from the sport with a Doctors permission, however a serious condition would likely stop you. You will benefit from a basic level of fitness, but being slightly overweight or slightly unfit won’t stop you from doing really well in the course. It is something you can work on. Is there any self-study to do? We have put together some useful exercises and a reading pack for you to help you during the course. It is not compulsory to do this, however highly recommended. Do I have to have any previous diving experience to do the AIDA 2 Star Freediver course? No. It is designed as an entry level qualification, however, there is scope if you do have experience to still get benefits even from the entry level course. Our instructors are very experienced, so can take you to a higher level than required just to pass the course. Chris Crawshaw learned with Apneists UK, here he is with his first successful UK record in 2012. 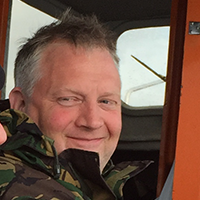 John Moorcroft is coached by Steve Millard of Apneists UK, current UK record holder 176m DNF.